Until a few decades ago, shiitake mushrooms were an exotic import to the United States, but they’ve been cultivated for hundreds of years in China and Japan in a climate very similar to our own. Tucker Pforzheimer and Truman French met in a college mycology class, and they’ve transformed their interest in mushrooms into a sustainable model for local food production. “That’s what drew me and Truman in, to fill in a missing piece in the area’s food economy,” Tucker says. Shiitakes are a good source of essential amino acids and other nutrients, which can supplement or replace meat in a healthy diet, and they’re much easier to cultivate. Martha’s Vineyard Mycological, MVM, grows mushrooms on-island in a sustainable manner. Truman was an economics major with a strong interest in biology, and Tucker majored in evolutionary biology. After Truman graduated from college, he was clearing a horse pasture here and didn’t want the logs to go to waste. He convinced some of his friends from the mycology class to come down to the Vineyard, Tucker says. They inoculated logs with mushroom spores that weekend, in the spring of 2014, and then they waited. In the spring of 2015, one of the logs bore fruit, and that summer Truman and Tucker went door-to-door, selling their mushrooms to local restaurants. Since then, their business has grown. 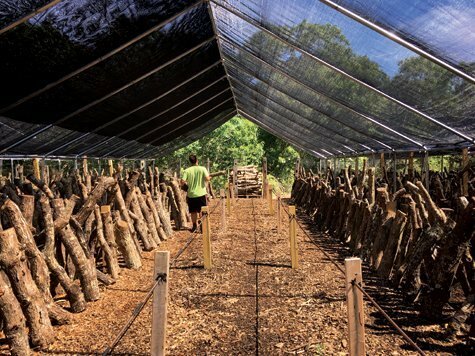 During the 2018 season, they harvested about 25-40 pounds of mushrooms a week, and they expect to continue production here at about that level, because that’s what their supply of fresh logs will support. “We inoculate 10,000 logs every year,” Tucker says. The logs are in production for about three years, and during that time the mushroom is eating away all the wet cellular material in the log. By the time the mushroom is done digesting what it wants to, the log is perfectly seasoned firewood. In the winter, there are no fresh mush-rooms, but MVM sells dried and pickled shiitakes through their website, www.mvmycological.com, and at Cronigs, LeRoux, and The Larder. Next summer, look for them again at the Morning Glory farm stand and the West Tisbury Farmers’ Market.